Astronomers have discovered two new moons orbiting Jupiter and relocated five ‘lost’ moons belonging to the Solar System’s largest planet. Scientists made the serendipitous discovery while on the hunt for ‘Planet X’ – a Neptune-sized planet believed to be lurking beyond Pluto. Scott Sheppard, a Carnegie science researcher at the Department of Terrestrial Magnetism, was surveying the night sky with colleagues, David Tholen of University of Hawaii and Chadwick Trujillo of Northern Arizona University, when they directed their telescopes towards Jupiter and spotted two new, mile-wide moons. Jupiter has 53 officially named moons, and over a dozen “provisional” satellites awaiting confirmation before they are named by the International Astronomy Union. The two new moons, S/2016 J 1 and S/2017 J 1, were observed in March 2016 and March 2017, respectively. 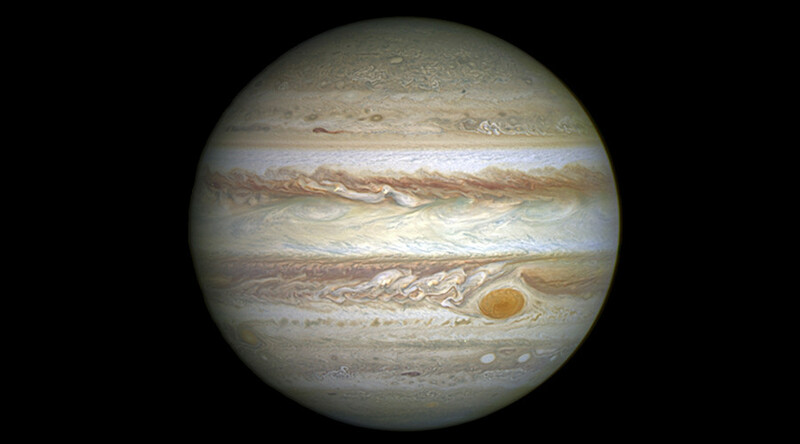 Sheppard and his team also identified a number of moons that had been classified as “lost.” As of the beginning of 2016, the whereabouts of 14 of Jupiter’s previously discovered moons were unknown. However, five of these strays were recovered when Sheppard’s year-long observations were compared with the initial observations from 2003. S/2016 J 1 and S/2017 J 1 did not link to any past Jupiter moon observations, leading researchers to declare them to be two new moons. It’s still likely that there are more moons hidden in the team’s 2017 observations, but they will need to be re-observed in 2018 to determine which belong to the remaining missing 2003 moons and which are new.